Former Lindenwood women's basketball coach Tony Francis watches on as the Lions played McKendree on April 2, 2017. 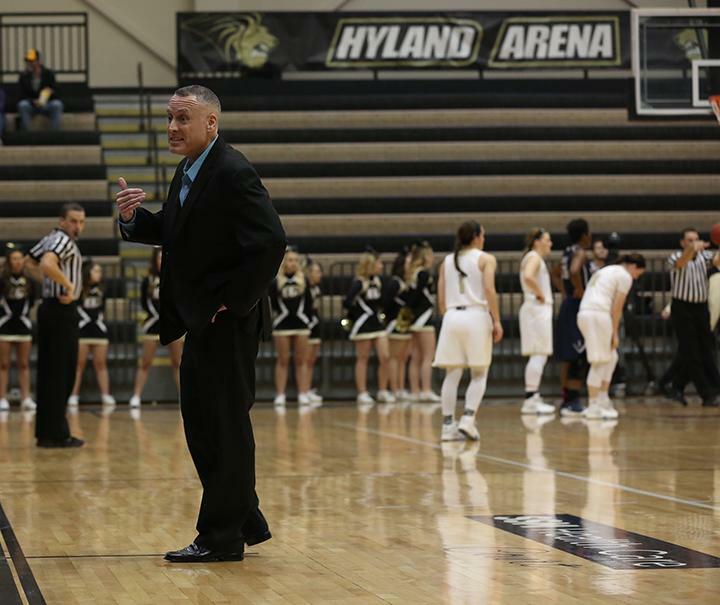 After leading the Lindenwood women’s basketball team to its most successful season in program history, Tony Francis has resigned from his job as head coach. Vice President for Intercollegiate Athletics Brad Wachler told Lindenwood Athletics that Francis resigned from his post to explore other professional opportunities. Francis took over the program in time for the 2010-2011 season while Lindenwood was still in the NAIA. In his first season in the NAIA, Francis led the Lions to a 21-win season, improving on a nine-win season the previous year. Once the Lions joined the MIAA conference in the NCAA, Francis steered them to the MIAA tournament every year the program was eligible, according to Lindenwood Athletics. This year Francis guided the Lions to the NCAA Division II tournament for the first time in program history. The Lions entered the tournament as the ninth seed out of 12 teams. In the quarterfinals, the Lions knocked off No. 1 seed University of Central Missouri. The Lions won the tournament by defeating three-seed Fort Hays State to qualify for the NCAA tournament. Jan. 4, 2016; 8:30 p.m. Falling apart in the second half, the women’s basketball wrapped up the first road trip of the new year with a 87-58 loss to Emporia State.